Savannah Brown's first collection of poetry is a vulnerable account of adolescence from someone in the thick of it. 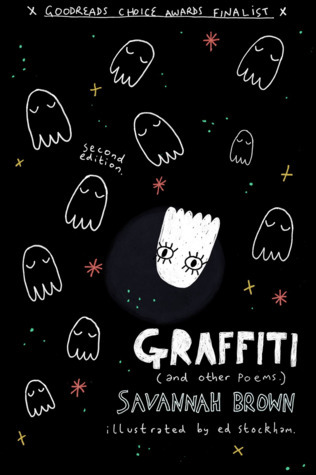 Written between the ages of sixteen and eighteen, with examinations of anxiety, death, first loves, and first lusts, Graffiti extends a hand to those undergoing the trials and uncertainty of teenagehood, and assures them they're not alone. I have seen a couple of Savannah's videos on youtube and I have always enjoyed her poems. Unfortunately this book wasn't for me. The problem wasn't tat it was a bad book or that I didn't enjoy it; there were many passages that I loved. The problem was I couldn't really understand what she was trying to say in her poem. It felt far too vague for what I enjoy, I imagine this style works brilliantly for many people because it left los of room for people to put their own being into the words but I want to know someone else feels the same way I do and I'm not sure that was what these poems did. However I could just have been my lack of life experience that caused a lack of understanding. I'm still very glad I read it and while it didn't click with me if you love beautiful metaphors this is the book for you. I can totally imagine an English teacher dissecting these poems. Anyway this book was good, the problem was definitely me rather than the book therefore I'm going to give this book 3/5 stars.